New Orleans features gumbo, jambalaya, king cake, beignets and Bourbon Street. And now, NOLA welcomes the Salina Falcons. 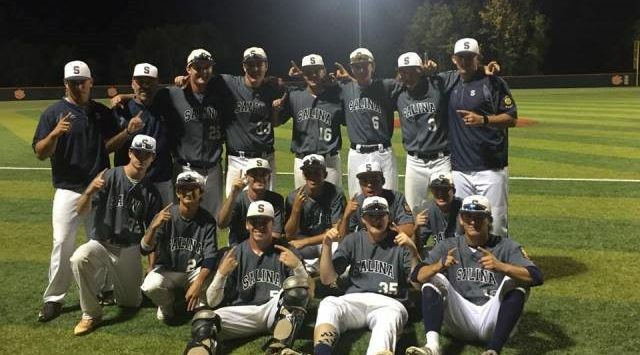 The strong pitching unit limited Iola to eight hits, Brogen Richardson drove in five runs, and the Falcons swept the Indians, 5-0 and 3-2, to claim the Kansas championship in the AAA vs. AA American Legion playoffs. Salina takes a 35-2 record to Louisiana on August 8. In the doubleheader, Salina plated all runs in just two innings. The fourth inning in game one saw the fireworks as Seth Catania and Cade Sterrett hit back-to-back singles. Brogen Richardson stepped to the plate and roped a two-RBI to right field. He later scored off a single by Brady McAfee. Sterrett and McAfee were lights out on the mound. Sterrett earned the victory, lasting five innings, striking out nine batters while giving up two hits. McAfee only pitched two frames, but limited Iola to one hit. The nightcap was much more interesting. Salina begun the third with back-to-back walks by Catania and Sterrett. After two popups, Richardson approached the plate and bombed a triple to right, scoring two in the process. Ethan Kickhaefer followed with a single, giving Salina a 3-0 advantage. Iola struck back in the sixth with a pair of runs, but Catania locked down the Indians for his third save. Richard Davis picked up the victory, going five-plus innings and giving up five hits and two runs. Salina opens the Mid-South Regional Tournament with a showdown against Bryant, the Arkansas champion. First pitch is after game one, which starts at 9:30 am.